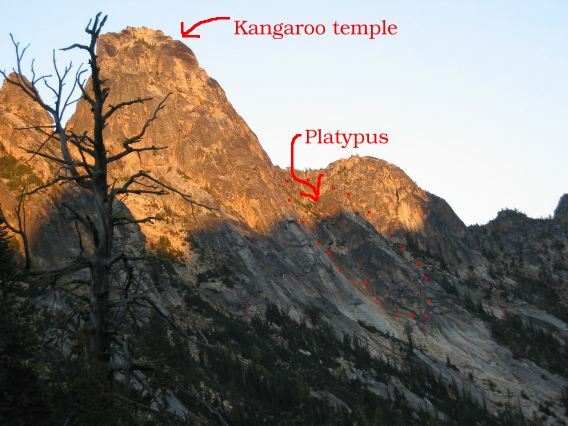 After changing our mind a few times about what we were going to climb (Index, Squamish, Kangaroo Temple, then our final plan), on Monday Sept 29, 2003, Jeremy Holleman and I (Ania) climbed Platypus, and top-roped a 5.10a. You may ask: what and where is Platypus? An excellent question! 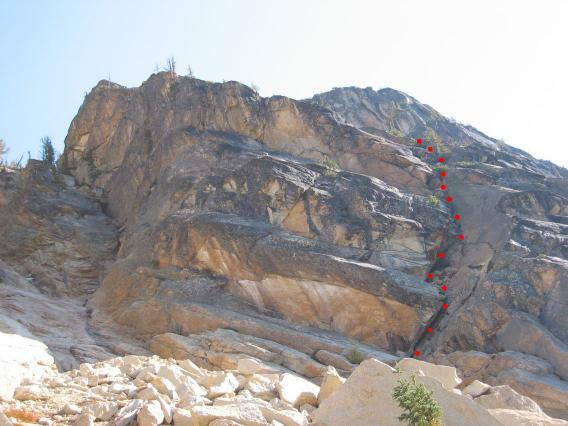 It's a big rock just south of Kangaroo Temple (which is very near Washington Pass), described in Beckey's book in just a few lines as having a 3.5 pitch 5.7. It goes up the "lefthand chimney". That's about all Beckey has to say about it. Not even a picture. 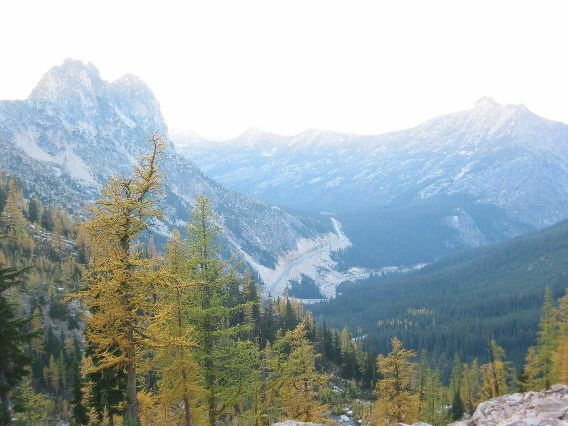 We rapelled off the SE face of Platypus. 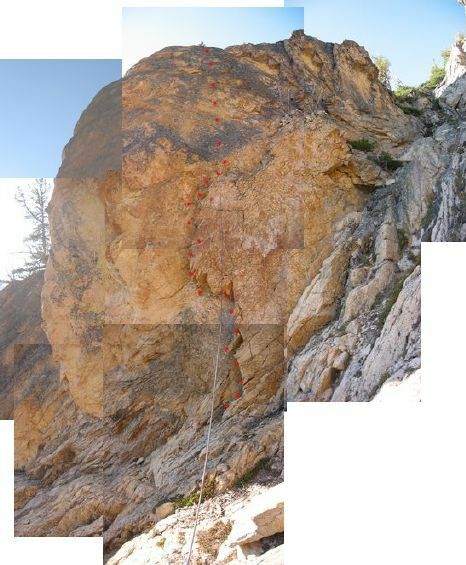 We saw no rap slings at the top nor anywhere else along the way, so we're guessing no one's climbed the thing for ages. There was no walkdown other than the way we came. We still had some day left and were feeling pretty mellow. 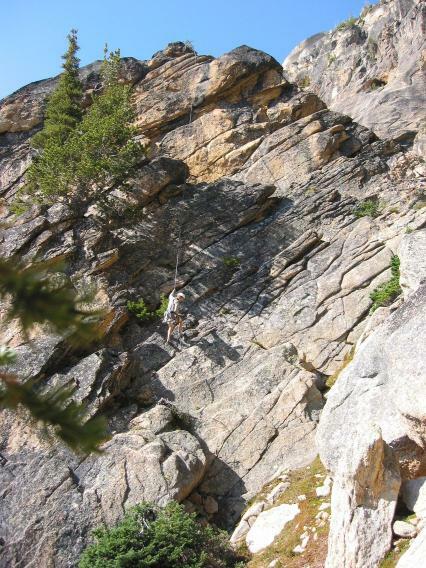 There's a lot of good rock in the area so we decided to explore and either lead something easy or top-rope. 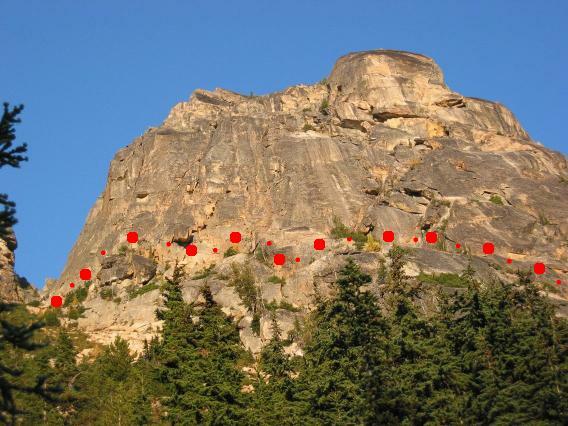 There's a big hump in the gulley usually used to approach the NW face of Kangaroo Temple -- right under the red dots in the photo below. On the side facing KT -- the side you can't see in the photo -- is our route.